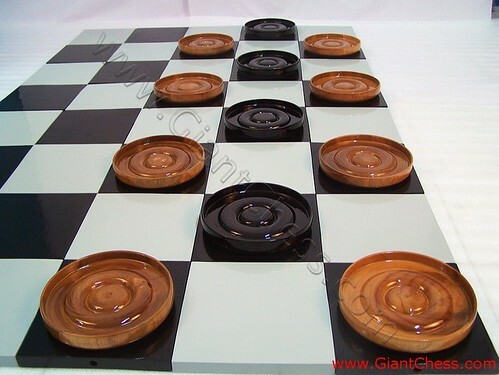 This checker set is made of Teak wood and carved carefully by expert cratfsman. Designed in big size than ordinary checker pieces. Perfect for outdoor play, so that we can use it at garden, camp, villa, beach and another interesting area. To play it outdoor, people also need big or giant checker pieces and rather wide board. We support it with our wooden board that easy to save and easy to move because the board is in pairs. Here is our checker product that made of Teak wood. The pieces and the board are very durable for outdoor use. With inlaid checkers pieces on the top of board is certainly something special. Different size of ordinary checker and board, this checker pieces is designed as giant checker and supported by its big board. Having checker game with your friend using this kind of big wooden checker at your garden.